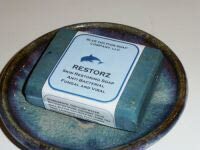 Olive oil soap, coconut oil, palm oil, shea butter, essential oils, botanicals. I have used several so called skin friendly product and this is one very special product. I highly recommend it to anyone with acne, blackheads, and redness. It's magnificent soap. You have to use it to understand how effective it really is. I heard about it on your website.